While I was scouring in the internet in search for a new steak recipe for Mr. How Sweet, I stumbled upon this treat of chocolate dipped clementines. Um… hello brilliance? Chocolate dipped clementines just SPOKE to me. It sounded fabulous. Fresh and delicious but sweet and rich. And topped with salt! I can’t handle the love. If I’m being honest, I must tell you that I got a little overzealous with the cake batter bark back in December, resulting in an outrageous amount of unused chocolate bars. I jumped at the chance to use one in another form other than just eating it straight from the foil. For breakfast. Plus, is this not a fun snack?! I think it’s the best thing if you’re looking for a cool after school snack or even something mid-morning if you have a serious chocolate craving. For me, that’s… always. And it’s healthy too. Fruit = healthy. Chocolate = antioxidants. SEE. I justify all the things. This means I ate four times the recommended amount. I need my vitamins. But really! This is a little dessert or snack that you don’t feel terrible about – even after eating an entire bowl of it. It’s also a super fun holiday appetizer or treat, because clementines are in season. And you’ll feel better about this than truffles. Trust me. These are also so fresh tasting. Juicy orange with a touch of chocolate and sea salt. Really, I just feel that I hit the snack jackpot. Place the clementine slices on a parchment paper lined baking sheet. Melt chocolate in either the microwave or a double boiler – if microwaving, do it on 50% power for 30 seconds, stirring after, until melted. Dip half the clementine in the chocolate then sprinkle with sea salt. Continue with remaining slices. Refrigerate for 10 minutes before serving. They stay great in the fridge! You don’t even want to know how we went to town on these. Pure brilliance. I will be trying these! Sea salt…genius! Made these immediately. And they were delic! I only had oranges, but they still turned out great. Thanks Jess! It’s so great to find someone who loves lindt as much as i do…. The streets are flooded with clementines this time of the year in Korea (being sold, not just rolling around on the street! )…I must make this stat! Oh. My. Goodness. I have all these ingredients on hand. I guess I know what I will be making myself this afternoon to munch on! Oh my goodness these look fabulous! I’m glad I bought a bunch of clementines the other day. Love it! Now I need to buy some chocolate – stat! Wow… your pictures of those chocolate dipped clementines look AMAZING!! Oh these are too cute and look delicious! I don’t love clementines but I might change my tune if they were coated in delicious chocolate! So simple and so beautiful! I think I will try these at the next cookie swap. Thank you for sharing these. Okay, so I noticed that you bought Trader Joe’s Vanilla Extract. How do you think that compares to Nielsen-Massey’s Vanilla Extract? I don’t live near a TJ’s or Sonoma-Williams, and was wondering if maybe you have tried both? oh what a great idea! chocolate and fruit are a great combo! Mmm, love chocolate and orange together. I should make these since I have both clementines and oranges right now. Okay. So I never used to be a fan of fruit mixed with chocolate! My grandmother, that raised me, used to buy the nasty chocolate orange or raspberry sticks. I remember being completely disappointed there was no caramel to be found! Well, I have matured. Or have become more desperate! But I love chocolate on pretty much everything! ha ha And especially if I can call it healthy! This would count for one of my diet snacks. :) Yum! BTW I don’t think the chocolate sticks are nasty anymore. I just don’t go out of my way to buy them but they sure give me sweet memories of my grandmother! I am not sure if the sea salt will be good idea. 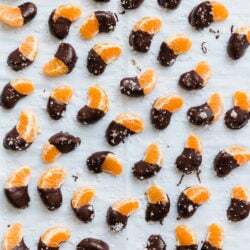 Pingback: Chocolate Covered Clementines | Foodbeast Chocolate Covered Clementines | Because We're Hungry. Pure Amazingness! These look absolutely heavenly! Wish i had me some of them right now! And cake batter chocolate seriously?! Gotta get me some of that to! Just made these for dessert tonight. The hubby and I of course snuck a few, and I love them!! These are gorgeous! Love the idea of clementines in chocolate. These sound so good.. and only semi bad for you. I’m definitely going to try these out! Umm… Yes, please! Brilliant. Just brilliant! These look absolutely divine. Gorgeous photos. You have a fantastic blog! oh my goodness YES!!! these are absolutely darling. great photos too! totally mouthwatering! ps. thanks for being so wonderful about commenting on my blog so often! you’re a doll. You have beautiful photographs! And this looks delicious! I made these this weekend. AMAZING!! Pingback: New Year’s Eve Party Food! | Love.Fit.Live. Can I make these in advance? How do I keep peeled clementines from drying out? i would make them maybe one day in advance and keep them in the fridge on a plate with a cover of plastic wrap.